^ Financial Statements for the Year to 31 July 2016 (PDF). University of Lincoln: 1. [3 May 2017]. ^ Vice Chancellors Welcome. University of Lincoln. [15 July 2011]. ^ Key Facts - University of Lincoln. Lincoln.ac.uk. [8 June 2017]. ^ 5.0 5.1 5.2 2016/17 Students by HE provider, level, mode and domicile (CSV). Higher Education Statistics Agency. [2018-03-25]. ^ Lincoln, University of. The Independent (London). 27 July 2007 [28 August 2008]. ^ Maps – University of Lincoln. University of Lincoln. [5 June 2008]. ^ David Foster. Unity out of diversity: the origins and development of the University of Humberside. Continuum International Publishing Group: vii. 1997 [28 May 2009]. ISBN 978-0-485-11513-0. ^ Papers of Cyril Bibby (1914–1987). The National Archives. [28 May 2009]. ^ University of Lincolnshire and Humberside Quality Audit Report, Collaborative Provision. Higher Education Quality Council. January 1997 [25 February 2011]. ISBN 1-85824-290-8. （原始内容存档于2010年6月6日）. ^ HM Treasury Lambert review of Business Collaboration (PDF). HM-Treasury. [3 July 2012]. （原始内容 (PDF)存档于2013年1月29日）. " ^ University of Lincoln-Higher Education Profile. The Guardian (London). 1 March 2008 [28 August 2008]. 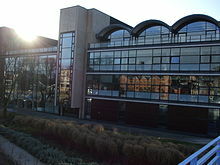 ^ University of Lincoln – Library and Learning Resources. The University of Lincoln. 9 August 2008 [8 September 2008]. ^ Converted library garners another award. ^ 20.0 20.1 World University Rankings 2015-16. Times Higher Education. 2015 [2016-09-07]. ^ University guide 2017: league table for Agriculture & Forestry. The Complete University Guide. [25 April 2016]. ^ University guide 2017: University of Lincoln. The Complete University Guide. [25 April 2016]. ^ Lincoln climbs up in the Complete Uni Guide rankings. The Tab. [25 April 2016]. ^ McCann, Grace. Star-struck Lincoln. The Independent (London). 24 October 2002 [5 June 2008]. ^ Uni Scores Hat-trick with Question Time Visit. University of Lincoln. ^ BBC Radio 4 favourite Just a Minute comes to Lincoln. University of Lincoln.